Looking for something a little different? Something that will create happy memories and be a talking point, remembered and cherished for ever? The Book of Love wedding invitation from Paper Themes will just do that, and more! It’s the little touches with this particular design that sets itself apart from your usual wedding invitation. The Book of Love has been designed as just that – a book! The front cover displays the title and the authors names. That is, ‘Our Love Story’ and ‘Written by’ followed by the names of the Bride and Groom. Your guests will turn the cover and will be greeted by two pages filled with important wedding details and guest information. They will also find a cute little ‘bookmark’ tied to a length of organza ribbon which acts as your RSVP card! This is truly a novel invitation…. pardon the pun. The blue colour will be nice and easy to match to any wedding colours, especially if the Groom is wearing a smart blue suit… *swoon*! 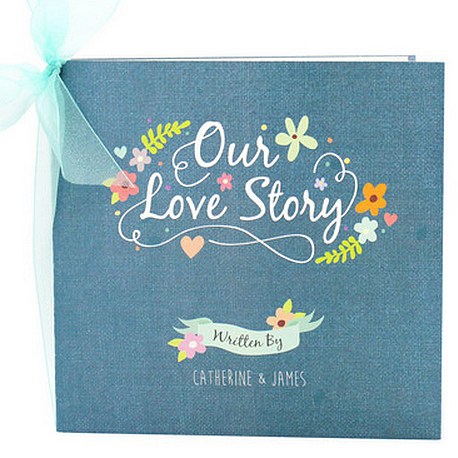 The words ‘Our Love Story’ and the little scroll below are written in a beautiful white font, surrounded by the most charming little leaves and flowers, tiny colourful dots and little love hearts. It feels just like spring, with the lovely flowers popping up everywhere. The inside doesn’t disappoint either. ‘Chapter One The Wedding’ is written in the same gorgeous font, whereas the wedding details are written in a cute, thin modern font that works so incredibly well, giving the invitation an overall unique chic and stylish look. The Book of Love is perfect if you want to keep everything stylishly in one place, without the need for separate information and RVSP cards. Plus, it also doubles up as a super keepsake for your guests to pop onto their bookshelf!